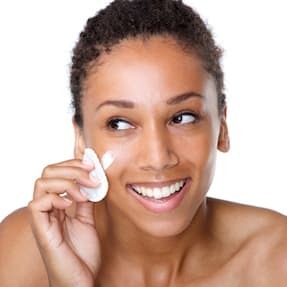 Credits: " ​Pexels at Pixabay.com"
The Integrative Skin Series is an educational series created by practitioners to discuss how different perspectives can be integrated for skin care and health. Psoriasis is a chronic, inflammatory, and scaling skin condition that involves the skin and joints. Since psoriasis is persistent and visible on the skin, the psychological effects can be devastating, leading to social embarrassment, anxiety and depression. Practitioners consider several different issues when treating psoriasis and here are some of the different approaches to psoriasis. What Parts of the Body Does Psoriasis Affect? Psoriasis can affect as little as one spot on the skin or can affect the entire skin (known as erythrodermic psoriasis). In some cases psoriasis can also affect the nails. There are several different kinds of psoriasis and they have different kinds of skin lesions. Psoriasis that affects the joints is known as psoriatic arthritis. If this arthritis is not recognized early and treated, joints can become deformed in severe cases. Although many different joints can become inflamed, the joints most commonly affected by psoriasis include the joints of the fingers, toes, hips and lower back (sacroiliac joints). It is important to be able to differentiate psoriatic arthritis from the arthritis that comes with joint overuse (osteoarthritis). Muscles are connected to the bones by tendons and the point in which the tendon connects with the muscle can become painful in psoriasis. The pain is the result of tendon inflammation and is known as enthesitis. An example of a tendon that can be affected is the Achilles tendon as it inserts into the bones of the heel. A dermatologist can choose from topical treatments (for example creams and ointments), systemic treatments (either oral or injection based), and/or light based treatments. When psoriasis affects one or few small areas of the skin, the use of either topicals or light based treatments may be enough to keep the disease under control. In cases where psoriasis is widespread or not responding to topical and light-based treatments, systemic medications may need to be started. If there is a concern for joint pain or for tendon insertion point inflammation, your dermatologist may push for systemic medications even if the psoriasis does not involve much of the skin. Here, the idea is to stay ahead of the disease and prevent the irreversible damage of joint inflammation. Ayurveda involves examination of the balance of the three physiological energies (known as doshas): vata, pitta, and kapha. A patient with psoriasis can have several variations from the Ayurvedic perspective. All forms of psoriasis involve an imbalance in the pitta dosha. This imbalance is represented by the presence of redness and inflammation. Since all lesions of psoriasis have some degree of scaling, all forms of psoriasis have some degree of vata imbalance. The vata imbalance is much higher when there is widespread scaling (such as erythrodermic psoriasis) or when there is thinning hair (severe scalp psoriasis). Kapha imbalances are not typically seen on the skin but may be present internally as fatty liver or joint swelling. An Ayurvedic practitioner will look to correct the imbalances that are present through a variety of approaches that include dietary and lifestyle changes, along with herbal supplements and topical oils. 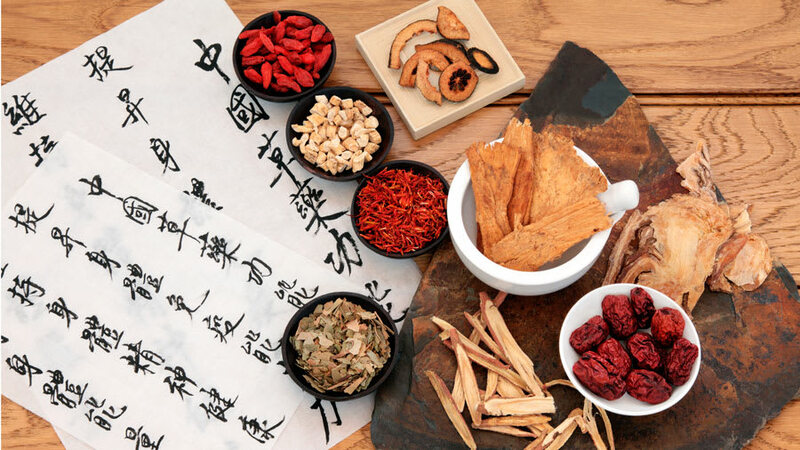 Traditional Chinese Medicine (TCM) has a long history of treating psoriasis with Chinese herbal therapy and acupuncture. Psoriasis is one of the most common conditions seen by TCM practitioners. Psoriasis is called bai bi (白疕) in Chinese which is translated as “white mange." This is due to the characteristic white scales of psoriasis. 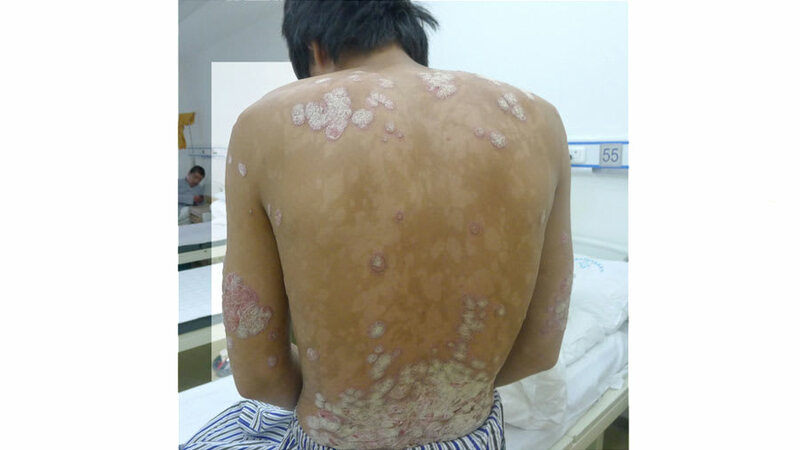 Important to Chinese medicine is first determining the nature of psoriasis. The TCM practitioner will consider the type of psoriasis as well as the specific appearance and feel of the skin along with other symptoms such as digestion, frequency of sore throats, ease of getting colds, body feelings of hot and cold, and joint pain. Heat is the primary factor in psoriasis because hot type conditions often cause redness on the skin. The size, shape, and shade of red will indicate the type of heat. Plaque, guttate, and scalp psoriasis are caused by heat and wind which leads to the development of scales. If the heat is stronger and deeper, the plaques will be darker and redder. As the condition persists, blood dryness and blood stagnation may develop. [4-6] In blood stagnation, psoriatic plaques are irregular, thick or hard, and may be purplish in color. Additionally, joint and tendon pain is often caused by blood stagnation. In blood dryness, the skin is very dry and pale. The disease has had a long duration with the rare occurrence of new skin lesions, but itch and discomfort may be a persistent issue. Both inverse and pustular psoriasis are related to the presence of damp, heat, and toxins. Some research has suggested that the different psoriasis patterns have unique inflammatory markers, which may explain why different herbs work for different patterns. Further research is needed to explore this idea. Chinese herbal medicine is the most common therapy for psoriasis. Chinese herbal medicine is often given in multi-herb formulas that are boiled into a strong tea called a decoction or taken as pills. Creams, ointments, and soaks are also given. The herbs in the formula are personalized to target the specific personal imbalance causing psoriasis. For example, if blood heat predominates, herbs that clear heat will be the focus of the formula. But if blood stagnation is dominant, herbs that move stagnation will be used. In the clinic these imbalances are often combined, so herbs that clear heat and move stagnation are often used together. A number of small studies have shown various TCM formulas to be effective at reducing psoriasis. [10,11] Many have focused on treating wind heat psoriasis with herbs that reduce heat and toxicity. The main types of psoriasis in the TCM view are blood heat, blood stagnation, and blood dryness. This classification depends on the appearance and location of psoriasis, the duration of the condition, and overall body symptoms. Herbal formulas for treatment are personalized to the patient’s needs and a particular type of psoriasis. A TCM professional can help determine what combination of approaches would best help you. 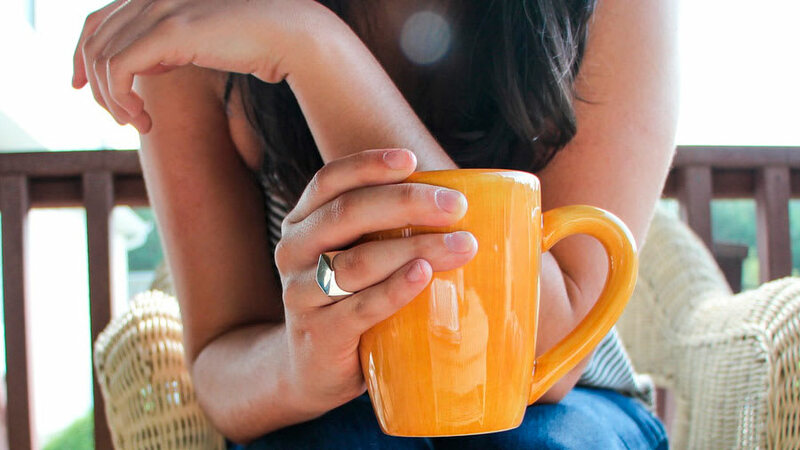 Psoriasis is a chronic, frustrating, and embarrassing condition for those affected. An integrative approach to psoriasis combines our general understanding of psoriasis with an individualized approach to each person’s unique features. Integrative therapies take a broader approach to psoriasis beyond what is offered through any one discipline. Western approaches may offer topical medications, light-based therapies, or systemic (oral or injectable) medications depending on the severity and the presence of joint inflammation. Traditional Chinese Medicine and Ayurveda are ancient medical traditions that focus on balancing energies and creating harmony in the body and the skin. 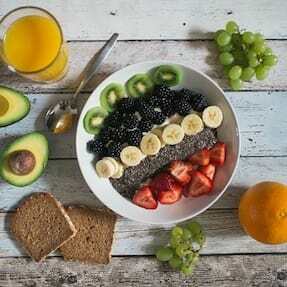 Additionally, integrative approaches emphasize many options including supplements, holistic therapies such as acupuncture, and lifestyle changes that may not have been emphasized in the Western approach. Nguyen CM, Beroukhim K, Danesh MJ, et al. The psychosocial impact of acne, vitiligo, and psoriasis: a review. Clin Cosmet Investig Dermatol.2016;9:383-392; PMID: 27799808 Link to research. Polachek A, Li S, Chandran V, et al. Clinical enthesitis in a prospective longitudinal psoriatic arthritis cohort: Incidence, prevalence, characteristics and outcome. Arthritis Care Res (Hoboken).2016PMID: 27998023 Link to research. Zhang CS, May B, Yan Y, et al. Terms referring to psoriasis vulgaris in the classical Chinese medicine literature: a systematic analysis. Complement Ther Med.2016;25:55-60; PMID: 27062949 Link to research. Yang X, Chongsuvivatwong V, McNeil E, et al. Developing a diagnostic checklist of traditional Chinese medicine symptoms and signs for psoriasis: a Delphi study. Chin Med.2013;8(1):10; PMID: 23663296 Link to research. Zhang GZ, Wang JS, Wang P, et al. Distribution and development of the TCM syndromes in psoriasis vulgaris. J Tradit Chin Med.2009;29(3):195-200; PMID: 19894384 Link to research. Xuan ML, Lu CJ, Han L, et al. Circulating levels of inflammatory cytokines in patients with psoriasis vulgaris of different Chinese medicine syndromes. Chin J Integr Med.2015;21(2):108-114; PMID: 25523599 Link to research. Coyle M, Deng J, Zhang AL, et al. Acupuncture therapies for psoriasis vulgaris: a systematic review of randomized controlled trials. Forsch Komplementmed.2015;22(2):102-109; PMID: 26021960 Link to research. Jeon YC. Treatment for an Adult Patient With Psoriasis with Traditional Korean Medicine, Especially Sa-Am Acupuncture and Herbal Medicine. J Acupunct Meridian Stud.2016;9(2):88-92; PMID: 27079230 Link to research. Deng S, May BH, Zhang AL, et al. Phytotherapy in the management of psoriasis: a review of the efficacy and safety of oral interventions and the pharmacological actions of the main plants. Arch Dermatol Res.2014;306(3):211-229; PMID: 24253308 Link to research. Parker S, Zhang CS, Yu JJ, et al. Oral Chinese herbal medicine versus placebo for psoriasis vulgaris: A systematic review. J Dermatolog Treat.2016:1-11; PMID: 27366921 Link to research. Li FL, Li B, Xu R, et al. [Qinzhu Liangxue Decoction in treatment of blood-heat type psoriasis vulgaris: a randomized controlled trial]. Zhong Xi Yi Jie He Xue Bao.2008;6(6):586-590; PMID: 18559235 Link to research.